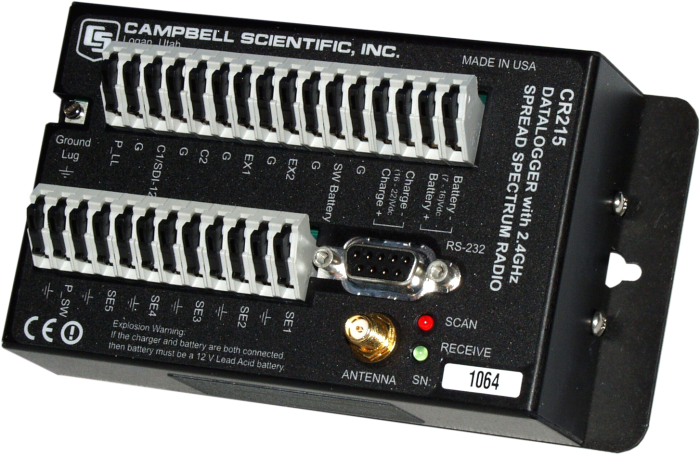 The CR215 was a small, low-cost data logger with an internal 2.4 GHz spread spectrum radio. It was replaced by the CR216, has improved communication capability. The CR215 can be used within a CR216(X) network, but the CR216(X) needs to be in the transparent mode. Contact one of our application engineers for details. The CR215's internal spread spectrum radio can transmit data to other CR215 loggers or RF415 radios. It can also communicate with CR216(X) loggers, RF416 radios, or RF432 radios if they are set to the transparent mode. 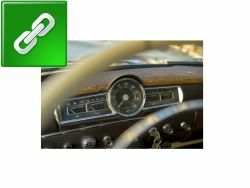 Certain CR215 settings must match the radio's settings for communications between the data logger and radio to be successful. The factory default settings of these devices might not match; therefore, they may need to be reconfigured before communications can take place. The CR215 can communicate with a PC via direct connect, NL100 Ethernet interface, MD485 multidrop modem, and digital cellular modems. Data can be viewed on the CD295 DataView II display, Archer-PCon Field PC, or a user-supplied PDA (PConnect or PConnectCE software required). The CR215 is not compatible with SDM devices and multiplexers. The CR215 can measure a variety of sensors including SDI-12 sensors and 4 to 20 mA sensors. It cannot make differential measurements and is not compatible with the freezing-rain/ice, fuel moisture/temperature, geographic position, present weather, soil heat flux, soil matric water potential, and strain sensors listed on our price lists. Applications with minimal power requirements can use the ENC200 enclosure to house the data logger and the #16869 sealed rechargeable battery. The ENC200 cannot house a barometer or a battery that is larger than the #16869. However, an ENC10/12 or ENC12/14 enclosure is adequate for most CR215-based systems. The CR215 uses an external power supply and has a built-in regulator. When connected to the on-board charging circuit, the sealed rechargeable battery should be 7 Ahr or smaller. Using larger batteries with the data logger's built-in charger may result in excessive PC board heating. This is especially a concern when the battery is deeply discharged or failing with a shorted cell. Campbell Scientific also recommends that solar panels be 10 W or less and wall chargers be 1 A or smaller. Special operating system that supports ModBus communication and SDI-12 sensors . Also included is the Compiler and CRBasic Editor support files for the CR2xx dataloggers. Note: Not to be used with the CR200X series. Default operating system loaded into the datalogger at the factory. Also included is the Compiler and CRBasic Editor support files for the CR2xx dataloggers.